We get up on the dance floor and try to synchronize our bodies to the rhythm of the music. The toe taps, wrist flicks, and questionable twerking are transformed into a graceful physical performance. The brain is able to orchestrate these movements, signaling our joints when and how to move. There are several neural mechanisms related to dance that can offer insight into the human brain and how it’s able to execute such coordinated behaviors. Such exquisite body movement is a marvel to witness in both a physical and psychological way. When we move, we employ neurons and body chemicals to control the muscles that affect the joints, movement, and balance. The nervous system activates groups of muscles, referred to as “motor modules,” which work together to achieve a wide range of motion. Voluntary movements, like starting on the second beat in salsa dancing, originate in the motor cortex, which is involved in the planning, control, and execution of this movement. Signals from the motor cortex travel down the spinal cord’s 20 million nerve fibers to tell, for example, the wrist or the toe to respond in a certain way. Interestingly, the smaller the movement, the more devoted the motor cortex is to that particular motion. The somatosensory cortex, a mid-region of the brain responsible for motor control, also plays a role in eye-hand coordination. Meanwhile, the basal ganglia, a group of brain cells, communicates with other brain regions to smoothly coordinate movement. It also moves the body accordingly in response to sensory information . "We call them habits," Samira Shuruk, a professional dancer of 30 years, who is certified by the American Council on Exercise, told Medical Daily . "Both the basal ganglia and the cerebellum are key components in memory, habit, and movement. They both also are put to work in dance learning and execution." The cerebellum integrates input from the brain and spinal cord into the planning of these fine and complex motor actions. And this process plays an important part in translating neural signals into actual dance floor moves. Dancing improves brain function on a variety of levels. For one, our muscle memory allows us to learn how to perform a dance without thinking about the steps. According to neuroscientist Daniel Glaser, this happens because “the movements become thoroughly mapped in the brain, creating a shorthand between thinking and doing,” he told The New York Times. In other words, we memorize how to do things so efficiently that they require no conscious effort. In dance, this is done by constantly repeating movements, which are practiced to the point that they can be performed automatically. Although muscle memory can’t really distinguish a correct movement from a wrong one, some research suggests the endorphins released after performing a successful move cause the brain to store it as the correct way of moving — a process that constantly rewires the brain’s neural pathways. Dr. Becca Rodriguez, an osteopathic physician for the San Diego Ballet, The Academy of Performing Arts of San Diego, and The San Diego Symphony, believes we can stimulate muscle memory cells, called B cells, with any activity. “These cells are activated with repetition of activity or motions and help our bodies to remember certain movements for choreography,” she told Medical Daily. The shift from actively thinking about the dance moves to performing them intuitively causes a shift in brain activity from the cerebrum — the “thinking part” of the brain that controls voluntary movement — to the cerebellum, which controls equilibrium and balance, and coordinates movements signals produced in other parts of the brain. Altogether, this allows us to carry out the movements effortlessly. The cerebrum makes up less than 10 percent of the brain’s mass, but contains over 50 percent of the brain’s neurons. A study published in the journal Cerebral Cortex found repeated spinning practice in ballerinas actually increases cerebellum size and decreases the sensation of dizziness. Dizziness stems from the vestibular organs in the inner ear. The fluid-filled chambers are able to sense rotation of the head through tiny hairs that sense the fluid moving. When we spin quickly and then stop, the fluid continues to move, which gives off the sensation that we’re still spinning. Going back to muscle memory, whenever we hear music and immediately start dancing without thinking, we access our cerebellum, which understands how to move our muscles quickly. There’s proof of this when we start thinking about our dance moves; it gets in the way of our automatic thought processes, and we end up fumbling the moves. Our brains are malleable, thanks to a mechanism known as neuroplasticity. While we’re not able to regenerate our limbs, we can build up our brains by forming new connections. Gray matter — where the majority of neural cells are held — can shrink and grow, leading neural connections to either copy and refine themselves or weaken and sever, respectively. Evidence suggests these changes can lead to changes in our abilities. Dancing integrates several brain functions involved in kinesthesia, following musical rhythm, and emotion, all of which boost our brain connectivity. For example, the book Spark: The Revolutionary New Science of Exercise and the Brain, provides a plethora of evidence that suggests physical activity yields large cognitive gains, like greater volume of gray matter in the hippocampal region of the brain, which is important for memory. An increase in grey matter is associated with a younger brain, and overall better brain health. Dancing can ward off brain diseases and increase mental acuity at all ages. Participating in dancing or similarly engaging activities can dramatically reduce the occurrence of dementia and Alzheimer’s disease. A 2013 study published in the New England Journal of Medicine found freestyle dancing, which requires rapid-fire decision making, is essential to keeping a sharp mind because it forces the brain to regularly rewire its neural pathways, especially in regions involving executive function — mental skills to help us get things done — long-term memory, and spatial recognition — using reasoning skills to decipher objects in 3D and draw conclusions from them based on limited information. “All of the actions listed above are due to increased blood flow, neural response when we listen to music, the psycho-social response we have when we interact with other people and the muscle-tendon junction response for stimulation of strength/balance in the human body,” said Rodriguez. 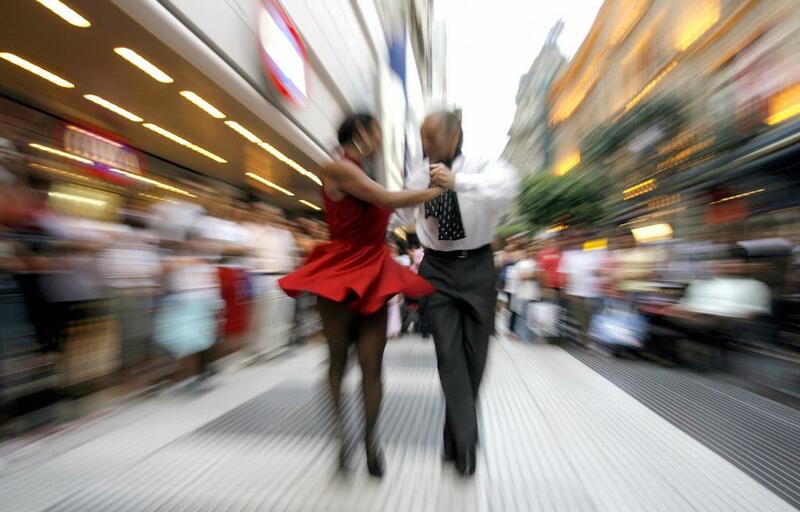 Perhaps we can dance the night away to better brain health, even in old age.